My love of family history came from my grandmother. Growing up, I recall asking a lot of genealogical questions that most of my family couldn’t even begin to answer – except, of course, for Grandma Record. She had the gift of recall, and could summon a second cousin’s birth date as easily as she recalled (by rote) the names of the streets in the small town where she grew up – sixty years later. Indeed it was my grandmother who kept what records we “Records” did keep – when we kept any at all. My great-grandmother, Gertrude Burson Record (1888-1965). Remembering this, I got out the old family tree “booklet” I had inherited almost 25 years ago. It contains all our old vitals on pages that still shout out “purchased on clearance at Sprouse-Reitz.” By the 1960s the study of genealogy had finally come home to the dens of ordinary folks. We could now record our family histories as we watched the Ed Sullivan Show and men traveling into space. However, I needed to (and still do need to) supply more information to complement my grandmother’s original records. While I’ve been pleased at how much I’ve filled in “after the fact,” there still remain all those blank spaces. The knowledge of my ‘genetic stew’ has increased since my grandmother’s entries, but I am still vexed as I spy too many of those forgotten family lines in my records. A forgotten family line is a lot like a dropped call. The line returns only static, so we tend to give up. These forgotten lines are what make each of us an extra branch in someone else’s family tree – requiring a shift in our own research perspective. Usually these forgotten lines are relegated to the “bulk section” of our ancestral root cellar, ignored and often neglected, remaining items we are always planning to get to – and never quite do. As far as the tree goes, I knew that Thomas Burson of Columbiana County, my great-great-great-grandfather, had married Harriet Reeves. [iv] Because the Bursons were Quakers I presumed that the Reeveses (whoever they were) might also be of that faith. So I began to look for Harriet Reeves, wife of Thomas Burson, and began to pick up one of those dropped and forgotten lines to see what I might find. As I researched, I found an unsourced family tree listing Harriet Reeves. There was no reference to any husband. I knew I needed to move onto the Quaker records, and that I should just move past an unsourced family tree. Everything I had been taught about genealogy has been to document, source, and document again. So I had no expectations upon opening this singular family tree for a “Harriet Reeves” with no husband recorded – but naming her father. A father named Benjamin Reeves of Columbiana County in Ohio. Almost immediately, I was prompted (thank you, Grandma, and Ancestry.com) to look at the Wills and Probate records for Columbiana County. Located there was the will of one Benjamin Reeves. [v] Well, I had come this far on an unsourced whim, so I figured I might as well take a look. And there it was, right where it should have been: “…and to my daughter Harriet Burson…” Bingo. I now had Harriet Reeves Burson’s father, and I knew the name of my great-great-great-great-grandfather. Further, the estate papers showed Harriet’s husband Thomas was the administrator in the estate of his father-in-law Benjamin Reeves. 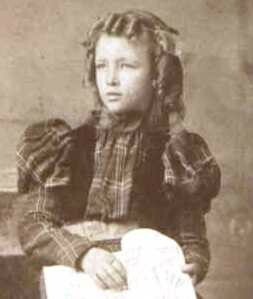 The will also named Harriet’s brother and six sisters, including one sister Mahala Reeves, a spinster, whose probate was administered by (her nephew) Hiram Burson, son of Harriet Reeves and Thomas Burson, and my great-great-grandfather. So I guess if there is a moral to this story it would be to not give up on those forgotten family tree lines. There is always hope of finding a clue in the strangest of unsourced places. If you want the answer (or if I do), one truly must leave no stone unturned. Here is to you, Benjamin! 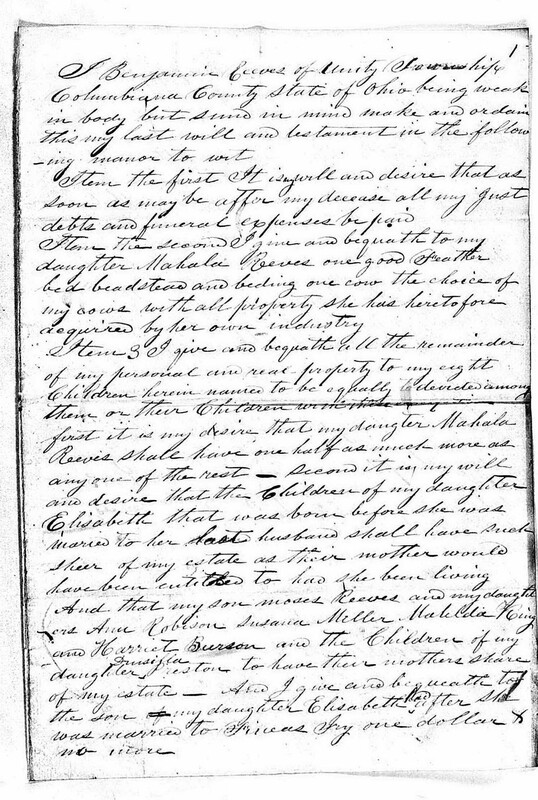 [ii] Sarah Cox Burson (1715–1786), daughter of Margaret Potts Cox; William John Potts and Thomas Maxwell Potts, Historical Collection Relating to the Potts Family in America and Great Britain (Cannonburg, Pa., 1901), 231, 260. [iii] Ann Burson Griffith (1721–1774), White House Special Files Collection and www.nixonlibrary.gov. 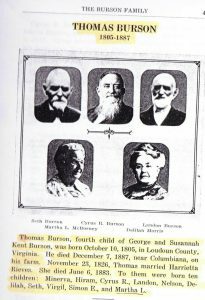 [iv] John C. Burson, History of the Burson Family (Acampo, Calif., 1932), 4; William Wade Hinshaw, Encyclopedia of American Quaker Genealogy, 4: 1: 653. Harriet Burson Reeves is said to have been “dis mou” – and disowned for marrying outside the faith. There is no indication that she and Thomas Burson ever recanted and applied for readmission. 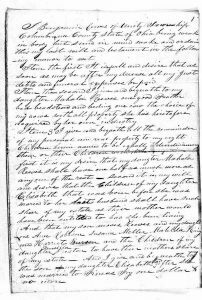 [v] Ohio, Wills and Probate Records, 1786–1998, Ancestry.com, probate record of Benjamin Reeves, Columbiana County Ohio, 17 June 1851. Thank you, Dr. Record! Finding lost lines is like finding treasure–especially if the treasure comes with new relatives and contacts! Those wills, and almost as important, the later documents about distributing property of the deceased to heirs – sometimes many years later – are a goldmine. I found names of spouses of daughters, grandchildren, second marriages, and a couple of very mysterious relationships that took additional time to sort out. It was wonderful! I inherited the same book with our families genealogy from my mother. I have also gone back 3 more generations using her information, undocumented as it was. Those books must have been in every 5 and dime I. The country. Yep, you’ve gotta grab whatever slim clues you can find. When I get to that point, I also start contacting people who publish those trees to find out what they know. It’s surprising how much info some people have that they don’t reference in their online trees. 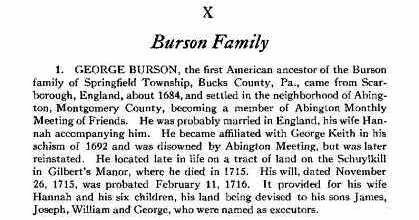 Lots of Bursons are listed there as well. I love the county histories for giving context to ancestors’ stories. A lot of times I find connections I never knew existed. One Cass County, North Dakota history told about a whole group of related families who came from a specific town in current-day Poland, along with the story of one of the early settlers traveling back to bring the others here. A comment about people who can remember: my husband has one of those remarkable memories. He remembers names, places, dates, friends of friends, relatives of relatives, who he went to school with etc., etc. He is 84 now; we have been married 60+ years and I learn something every day from that remarkable memory. My task now is to video some of the stories he has to tell before it’s too late. Too bad we didn’t have that kind of technology when your grandmother was alive. Memory, what a gift! If video is too hard, just record his conversation. What a pleasant task. There are almost always unexplored lines in a family tree. I’ve overheard conversations many times in a library, where the gentleman (usually) announces that his tree is done, and a little gentle probing reveals that he has not done one single maternal line, from his mother on back. Sigh. I look for them all, which is why I have so many brick walls! Ooooh, Harshbarger! Did that line travel through Botetourt County, Virginia > Kentucky > Indiana during the 1700-1800s? I find that name among my Dresslers, Persingers, Glasburns and others who migrated that way. Not a real common name. Husband actually has two lines of Harshbargers. One went to Stark/Summit County, Ohio, directly from Pa. One ended up in Shelby County, Ohio, after a jaunt through the Shenandoah Valley. I think the ones who went to Kentucky were yet another family. I’d be happy to compare notes, though. You must have quite a time using search engines for “Record.” Imagine also my trying to find info on my husband’s family, “Blank” like blank wall, blank space, drawing a blank…..
Great find in that will. Oh Polly, I feel your pain! – From “Olympic, to arrest, to LP’s” and beyond. The Smiths and the Jones must have it easier in this regard! Family names like “Black” and “Brown” are lots of “fun”, too! Just this week found a clue in a probate record which led me to a family member – known of but whose identity was forgotten for some seventy plus years…and, yes, one of those unsourced public trees helped with a clue. I just love reading your blogs and am excited to hear more about your family. I have a situation of an undocumented line that was my step grandfather’s ( the second husband on my maternal side) I felt since he was ” a step grandfather” that I really didn’t need to look into his family tree. Well low and behold I did just that earlier this year and boy was I surprised of the findings AND the actual trouble I had finding that information out. I knew what state he was born in and his birthdate but that’s it but nothing else. So I dove into the research completely blind. I looked for birth certificates in the state but couldn’t find anything remotely close so I decided to try and get his death certificate and that’s where the trouble AND surprise findings came in. I ended up needing my birth certificate, my mom’s birth AND death certificates, my grandmothers birth AND death certificates AND their marriage license in order to get his death certificate. What a ride that was and a wait time getting the certificate and that’s when the surprise came in finding out that HE had been adopted way back between 1900 and 1907. So that’s why I couldn’t find his birth certificate in Iowa. Since then I found a few more interesting and surprising finds but don’t think I will be able to find out anything further. If I could possibly get the documentation from his adoption I might but since it was over 100 years ago AND I’m not real sure what state it was in. Wow Joyce, that is something else. I have to say I love this mystery! I’d ask you questions, but I’m certain you would have already exhausted any avenue I might mention. For me your quest is just the kind of genealogical adventure that keeps me going, 1/2 potential archivist and the other 1/2 private investigator. It’s also so true that some of these lines (like that of your step grandfather) can prove absolutely the most fascinating in terms of the thrill of the hunt – and the treasue at the end. Joyce, I have no dount that you will be successful in your results – keep at it! Let me know how it goes. I actually could get a few pointers from you on where to go from here. A delayed BC because he actually signed up for the Old Man’s Draft right after Pearl Harbor. A copy of that draft registration stating where he was born in Iowa. The DC stating both his fathers name and his mothers maiden name. Multiple census records from 1910, 1920, 1930 and 1940. The first with mom and dad and 2 older siblings, his maternal grandfather and maternal uncle. The siblings were all born in Iowa with the mom and dad, uncle and grandfather in Denmark. In 1920 it looks like he was with a widowed aunt and her family as a lodger and the bread winner in the family. In 1930 possibly back with his widowed mother who had moved to Nebraska (land records located there) and in 1940 with a married couple (not to be believed any relation). I also have found 2, yes 2, marriage certificates for his parents – 1 in 1907 and another in 1933. All names and dates on all documents have matched with each other. None of which makes any sense at all. I’m stymied on where to go from here. I did try to locate the father but with the name of Peter Olsen in Iowa you get the drift on how hard that has been. Lots of questions on him that’s for sure. 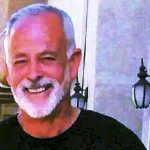 Did he die, was he abusive and mom and kids fled to Colorado with her family. So many questions and not enough answers. I guess the moral to this story is :”Leave no stone unturned!” Can’t say how many lists I have scanned, indices I have pored over carefully noting the page numbers to find my Charles or William etc…. I do not at any time consider whether it is an acceptable source because all I want is a lead. As you say it strikes your sleuth nerve! But, you gotta do the grunt work to make the golden discoveries. Once you have a lead, a spelling, a date, a place, a name then you follow it, and after you find your gold you locate the rest of the pot. I guess I’ll end this (grin) with another aphorism, “Once begun, half done.” Most grandma’s have used that one!! PS: I don’t think about it when I open my ancestry, its like opening a book and reading the page you open to. I just go where the book opens to. Thank you, Jeff. I now feel better about my thoughts and actions. Some are quite similar to what you went through in your blog account. I stumbled on an undocumented tree for a neglected line of mine (can’t easily find info so work on another), and my instincts said to be wary. However, I used one name to do further research, and suddenly this family and their movements opened up to me! There are many cracks to fill in and much to prove with documents and other evidence, but I’m on my way! Proceed with caution, but proceed I will.